The No. 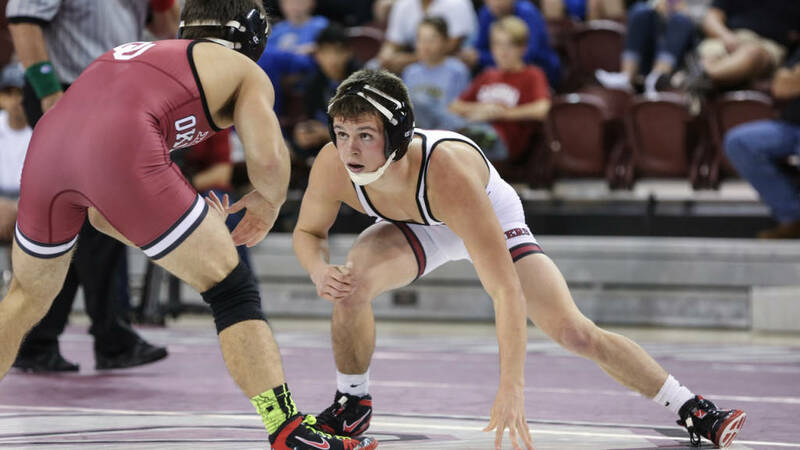 18 Oklahoma wrestling team started the season strong at the Journeymen/ASICS Collegiate Classic. The 16-team event was held at the Hudson Valley Community College in Troy, N.Y.
Two Sooners took first place in their respective divisions, including freshman Dalton Duffield (125B) and junior DaWaylon Barnes (157A). Duffield recorded a 3-0 record in the first tournament of his freshmen career. The rookie registered an 8-3 decision over Devin Brown of West Virginia in the first round, before a highlight-reel win by fall over Rider’s Brendan Calas in 1:34. Jens Lantz of Wisconsin injury defaulted in the finals for Duffield’s final win of the day. Barnes, a junior transfer from Northeastern Oklahoma, also impressed in his Sooner debut. Barnes pinned two, including one over No. 15 B.J. Clagon of Rider in 4:27. In the championship bout, the Muskogee, Okla., native defeated Lehigh’s Jordan Kutler, 3-2. Clark Glass (165A), Brad Johnson (197A) and Ross Larson (285B) all took second place in the first tournament of their redshirt senior season. Glass defeated Lehigh’s Gordon Wolf, 9-8, and Rider’s Chad Walsh forfeited en route to his championship-bout appearance. The match with West Virginia’s Dylan Cottrell remained scoreless before Cottrell escaped with five second left for a 1-0 win. At 197 pounds, Johnson posted a decision over Lehigh’s Ben Haas and Wisconsin’s Eric Peissig before dropping a 10-4 decision to Minnesota’s Brett Pfarr for the second-place finish. Ross Larson recorded a win over UNC’s Cory Gilliland-Daniel and a major-decision victory of Minnesota’s Rylee Streifel in the opening two bouts. The first-place match pitted him against No. 17 Doug Vollaro of Lehigh. Vollaro defeated Larson, 4-2. OU’s Christian Moody (125 pounds) registered a 2-1 record on the day, with his only loss coming to No. 6 Darian Cruz of Lehigh, 4-3. The redshirt freshman responded with two straight wins over Skyler Petry of Minnesota and Gerald Wert of Rider to take third place in his division. At 141 pounds, transfer Mike Longo also recorded two wins in the tournament. In his third-place bout, the junior secured the riding-time point for a 7-6 win over Cole Martin of Wisconsin. The Sooners return to action on Friday, Nov. 18 at 7 p.m. for their first home dual of the season against No. 11 Michigan inside McCasland Field House. Season ticket packages, which include tickets to each of OU’s home duals, are available online now or by calling the ticket office at (405) 325-2424 or toll-free at (800) 456-GoOU.